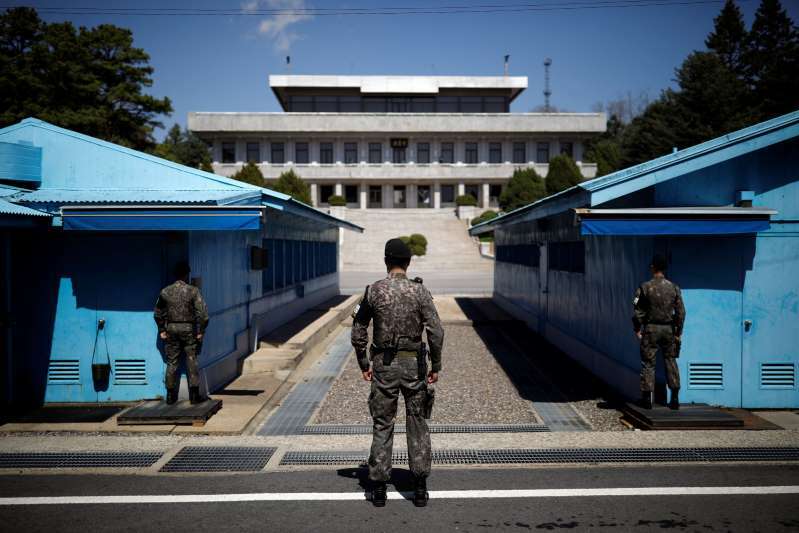 The measures were part of a military accord inked during last month's inter-Korean summit in Pyongyang, which includes a halt in "all hostile acts," and a gradual removal of landmines and guard posts within the Demilitarised Zone (DMZ). The United States has raised concerns that the deal could undercut defense readiness amid tardy progress on North Korea's denuclearisation, though it displayed support at an annual security consultative meeting of defense ministers on Wednesday in Washington. "The South and the North completely removed dangers of military clash through the military agreement," South Korea's President Moon Jae-in told the parliament on Thursday. "The two Koreas and the United States will achieve complete denuclearisation of the Korean peninsula and lasting peace based on firm trust." North Korea has also taken steps toward the pact, such as covering artillery deployed along the skirmish-prone western shore, Seoul's defense ministry said. "We will thoroughly verify the North side's implementation of the agreement, including its movement on military exercises around the MDL and whether it complies with the no-fly zone," the South's defense ministry said in a statement. The no-fly zone was a key sticking point for Washington because it would effectively bar close air support drills, in which airplanes provide firepower for troops who may be operating near enemy forces. The allies agreed to halt the Vigilant Ace air defense drills set for December in a move to spur nuclear talks with Pyongyang, while South Korea said it kicked off two military exercises on Monday outside the banned area. North Korean leader Kim Jong Un vowed to work toward denuclearisation during his historic June summit with U.S. President Donald Trump. But Pyongyang's actions have fallen short of U.S. demands for irreversible steps to scrap its arsenal, including a full disclosure of nuclear facilities and materials. South Korea's spy agency said North Korea was preparing for international inspections at some of its nuclear and missile test sites, the Yonhap news agency said on Wednesday. U.S. Secretary of State Mike Pompeo said he planned to meet his North Korean counterpart next week.